We all transliterate primarily for the use of karaoke, but what if the song is in parts where there's more than one singer? 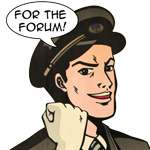 Fortunately, the forum markup is color-friendly, so we can utilize this for the benefit of our on-site lyrics. So, if you want a duet or multiple-singer song on AnimeLyrics have their individual singing parts indicated, please post up your color scheme here. Your post must contain 1) the link, 2) the song credits that include what color for which singer and 3) the current, full transliteration, will all the solo parts colored. Note that the default color for lines sung by all singers is the plain black. It is up to you to accurately pinpoint who sings which parts of the song in question. Please do not attempt this if you are unsure. THIS IS AN EXCELLENT IDEA!! Only, I already have more than 5 songs in mind. Should I post all of them directly here, (which would take up a lot of space,) or can I just compile all of them into a WORD file and then post that as an attachment? While Word attachments are indeed feasible (I did these myself in Word before) there's gonna be formatting problems all around because not everybody has the same Word version. If you already did this beforehand I'm sorry but you'd have to do it again through the forum markups. Also, one song per post. So for this reason I don't mind if you multi-post, but since there's a lot of work that needs to be done for the actual color-adding on the site, it's kinda low in priority so they may take awhile to be up. Oh, that's cool. I haven't done anything yet, so I guess I'll get started. I'll just post one at a time. Actually, just one for now, just to see if I'm doing it right. I'll need to go through my submissions and see where this applies. I'm sort of glad for this thread, since I got fed up with trying to do the html fairly quickly after figuring it out. Let it be known that I loathe to see 重ねる/なる translated as "pile up." Get a thesaurus, everyone's 和英! So I finally made the color-codes for ACUTE but had to alter the color schemes a bit because apparently the site default is not exactly black but dark blue (the color would be hard to see anyway). The dark blue is nice. More like sorta a dark turquoise-blue? Note: I'm not sure if Ritsu's color is distinctive enough from the normal lyrics; I put yellow green at first but it didn't look to good. Also in some parts I think I can hear Mio doing backing vocals (for example during Ritsu's first part and the first chorus) so I'm not sure if I should put stuff like Mio + Yui or something. Last edited by Rei; 12-12-2010 at 01:50 AM. Seeing how this kind of project seems to take a long time to complete, I won't flood you with requests, then. XD I did hear from ArtemisA too that it's not as easy as it seems. xRiikox can put up her request first. But still, please put up what you have, you never know if I actually have spare time... and actually it was quicker for me to do than I had expected. Last edited by AzureDark; 12-12-2010 at 02:24 AM. Also, a little off topic here: Are we allowed to post songs for tribute albums? For example this. Only if the songs are not covers. If they _are_ covers but the original singer can't be put in a section then they'll get through too. ...mmm looks like that album has to go to the NANA page for now. Kago no naka no tori wa itsu itsu deau? OOC: Isn't it Setsugekka? I've seen Setsugetsuka around a lot, but I don't think it's completely right...? 雪月花 can be pronounced either setsugetsuka or setsugekka in modern Japanese. The OLDEST way to pronounce it in Japanese was setu-getu-kwa, actually written せつげつくわ, from the classical Chinese pronunciation siet-ngiet-hwa. With the sound change of tu into tsu, as well as the gradual loss of the "w" sound, setu-getu-kwa became setsu-getsu-ka (せつげつか). The introduction of the small っ in the kana spelling reform caused some confusion among people, as they weren't entirely sure if they should keep 雪月花 as せつげつか or せつげっか. Some say they should stick with tradition and keep it setsugetsuka, while others say they should keep things more consistent and try to change as many big つ into small っ as possible (setsugekka). Lol yeah, it does. Like 夏恋模様, which looked like Natsu-Koi-Moyou but turned out to be Karen-Moyou (I don't know if that's a good example). People do still call it Yuki-Gatsu/Getsu-Hana, but that's like...reading singular kanji on their own. (And here I was thinking it meant Snow, Moon and Flowers.) Which is probably sort of correct, but I dunno. Last edited by Rei; 12-24-2010 at 10:36 AM. Last edited by animeyay; 12-25-2010 at 06:46 PM. So since the forum doesn't support double spacing, how would one submit a colored lyrics version with double spaces used? Would posting it with the colors (so that people can get an idea of what it'll look like), but then attach a .txt document of the complete lyrics to the post with the double spacing and all color tags included be okay? Last edited by Perfect Chaos; 03-05-2011 at 04:57 AM. Well, the double-spacing WILL show up on the site's page anyway (because it's already submitted). Just do the coloring using the forum's markup. It's not gonna be copy-pasted per se, and if you were intending to do corrections along with the coloring, do them the usual way first. Yeah anything official would be of precedence. I just finished translating this song and figured a color code would be neater. hokuro no aru basho shiritaku nai kai? Umm... I wasn't sure if I should include the translation+kanji here too... Oh well, gives me time to work on it some more. Don't do that, please submit t/ls through the usual way. tamashii no sakebi ga kikoemasu ka?